Thailand has over the years become a hot spot in Asia for retirement as the cost of living is low, crime levels are far lower than Europe or Spain and the weather is great most days of the year. Many people see Thailand as an excellent place for retirement. The Kingdom of Thailand has about 76 provinces which offer different attractions, cultures and experiences. It is for these reasons that many foreigners are drawn to retire in this country every year. The application process for retirement visa in Thailand is pretty straightforward. Over the years, however, this has become a rather confusing subject to many due to the inconsistency in the immigration processes. Not only are the processes varying in the Thai Embassies and Consulates around the world but also with some rules in different immigration offices all across Thailand. Consider the following guidelines if you wish to retire in Thailand. The client must be at least 50 years of age or over during the time of the application. A total of 800,000 baht combination of personal bank deposit and income or pension for the entire year. A foreigner who meets the age requirement set by the Thai Embassy (in their country) can directly apply for the 1 Year Non-Immigrant OA visa from their home country. Application for this type of visa requires the applicant to submit a police clearance and medical certificate. Getting a 1 year visa extension inside Thailand based on retirement requires an initial application for a Non-Immigrant O visa. The Non-Immigrant O visa is usually applied at the Thai Embassy in the applicant’s home country, but it can also be obtained inside Thailand. However, the applicant must already meet the financial requirement if they wish to go with the latter. In addition, applicants of Non-immigrant O visa extension in Thailand must provide evidence of their address in Thailand. Processing of visa extension is done at the immigration office in the same area, or usually the one nearest to their location in case there is none in their city or province. Once the applicant has obtained a one year extension of stay based on retirement, the extension can be renewed every year within Thailand. The renewal application must be done prior to the expiration of the current visa. The procedure for renewal is the same as for the initial application, and therefore this should be an easier task for retirees who are able to obtain an extension before. My Thai retirement visa expires in Dec 2016. I have one Bank acc (saving) and one (fixed acc.) with total of the money for the retired visa required. Do I have to credit my saving acc, with the fixed account before the 2 months required to show the amount in only my saving acc? or does not matter what account unless the amount show the total of 800,000 Baht? You will need to confirm the requirement of the specific immigration office where you plan to apply for the renewal of your visa. Some offices allow 2 bank accounts as long as the total is 800,000THB however it is not the same across all immigration offices. I am in Phuket. Can you tell me if its ok there? And last year was 3 months in bank account. I saw you need only 2 months in Thai bank account, so its different from Bangkok! Anyway the money is there but I want to be sure not to make a mistake. We would not be able to confirm the requirements of Phuket Immigration. I suggest that you get in touch with their office to inquire. The 2-month requirement for a Thai bank account is during the conversion of a 90-day Non Immigrant O visa to a 1-year Retirement visa. If you apply for a renewal of the 1-year Retirement visa, you need to have the money in your Thai bank account for at least 3-months before you can renew your visa. What is the earliest date – how many days before my current visa expires – can I apply for an extension of my retirement visa? You can apply for an extension of your retirement visa during the last 30 days of your current visa. My retirement visa is up in September but I need to travel then, how early can I renew my visa? You can apply for a renewal of your visa within a month before your visa expires. I will need to obtain a letter from the British Embassy to verify my income. Does this letter have to be dated say within one month of my application date –or is no time frame specified? Normally, the validity of documents issued in Thailand is 6 months. However, if you will use this as a requirement to be submitted to an immigration office, the validity differs. I suggest that you inquire from the specific office where you will use the document. I have a 30 day entry visa and want to turn this into a retirement visa, can i do this at Pattaya Immigration. You will need to obtain a 90-day Non Immigrant O Visa prior to obtaining the Retirement visa. You may apply for the 90-day visa from a Thai embassy or consulate in a neighboring country, otherwise, you would have to apply for it at the Thai embassy or consulate in your home country. TO MEET THE 800,000 BAHT IN THai BANK FOR RET. VISA, IS THE BANK BOOK THE ONLY THING I NEED TO SHOW IMMIGRATION? The immigration office will require an updated bank book and a guarantee letter from the bank confirming the current balance and that the funds were transferred from abroad. I already have a non-immigrant visa for 1 year from my home country in Singapore. Back then I submitted my police clearance and medical certificate. My visa will be expiring in Dec 2016 and I am intending to extend it in Bangkok. You mentioned the requirements for extension is the same for initial application, does it mean I have to resubmit police clearance and medical certificate? If so, how can I get a police clearance here in Thailand? For the extension of a non immigrant O visa into a retirement visa in Thailand, the medical check and police clearance certificate is not required. 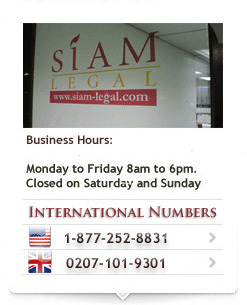 If you wish to extend it in Bangkok, you may call Siam Legal office at 02 259 8100 for assistance. Regarding the 800,000 baht, I have pensions that do not add up to 800,000 baht. I understand that I have to ‘top up’ with funds in my Thai bank account. But not knowing what the exchange rate for my pension will be in 3 month’s time, how do I know how much to have in my account? If the combination of the Thai bank account and monthly income is accepted in the province where you will apply for a 1-year retirement visa​ ​extension, you funds need to be 800,000THB in total. This means that after you multiply your monthly pension by 12, you need to deposit the difference into your Thai bank account at least 2 months before your date of application. How can you show a 2 month balance of 800,000 baht when you can only stay for 30 + 30 day extension? This does not add up or am I missing the point. I plan to enter on a tourist visa from Australia. You will need to open a Thai bank account, deposit 800,000THB into the account, and keep the amount in your account for at least 2 months. You can then apply for the 1-year retirement visa extension on your initial 90-day Non Immigrant O visa during the last 30 days of your Non Immigrant O visa. If the combination of the Thai bank account and monthly income is accepted in the province where you will apply for a 1-year retirement visa​ ​extension, your funds need to be 800,000 THB in total. This means that after you multiply your monthly pension by 12, you need to deposit the difference into your Thai bank account at least 2 months before your date of application. The problem with this is that when calculating the difference 2 months before the application, on the application date the exchange rate may well be different and the money deposited may well not be enough. How can this be rectified? It is best for you to transfer funds into your account in excess of the requirement to ensure that you have enough to meet the financial requirement.